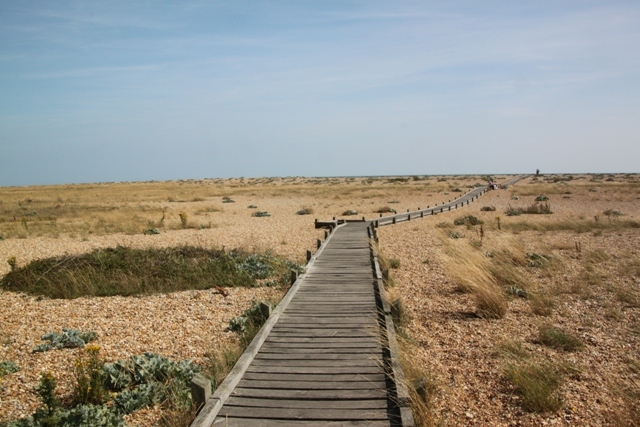 Dungeness, a National Nature Reserve and end of the train line for us was a real surprise – a desolate but stunningly beautiful place. Right by the sea but a far cry from the traditional English seaside resort, I loved it with its unusual and captivating shingle landscape. Apparently officially termed a desert (Britain’s only one) due to dryness and lack of surface vegetation, unusual flora and fauna thrive here and it is an important ecological site. We stepped off the train and found ourselves beside one of the two lighthouses, built in 1901 but no longer operational you can climb 150 feet to the top during the summer months. Everyone else seemed to be making this their goal for the afternoon, we decided to opt out and take the other direction. 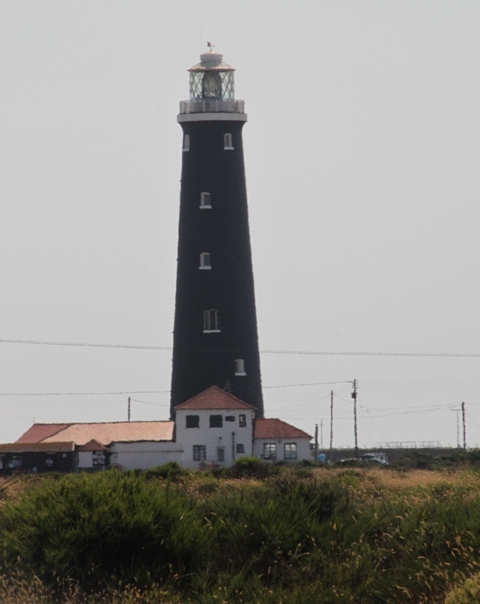 We found the second lighthouse further along, still working it was opened in 1963 but is not open to the public. Also quick to catch our eye was the Dungeness Power Station – a nuclear power plant which can’t be ignored but it didn’t dominate the landscape in quite the way I would have expected. Son had read about their visitor centre and was keen to check it out. We discovered it was at least a mile to walk from the station, on a hot sunny day with limited time before our train back we decided to focus on the scenery at hand and leave this for another visit. 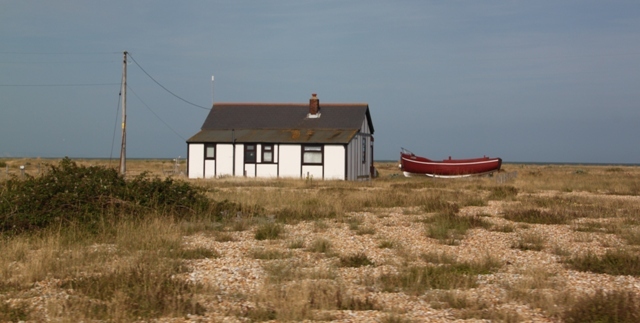 Loads of little cottages dotted here and there along the shingle, most made from old railway carriages, some are owned and lived in by fishermen who have their boats nearby. Artists and sellers of mystical artefacts are also drawn to this place, we found evidence of them too and I completely understand why they would be drawn to this eerie, desolate environment with its unusual and wonderful quality of light. We found the boardwalk and followed the path to the sea. 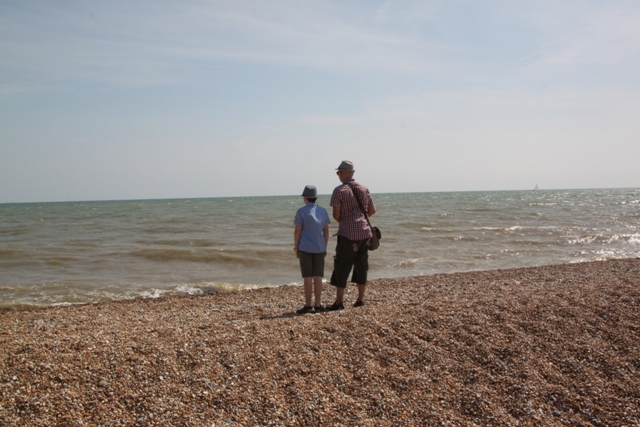 The beach was pebbly, Husband and Son skimmed stones and were in their element. Quite a breeze blowing on a still day elsewhere, it must be seriously windswept here in winter but on a hot, sunny day this breeze felt refreshing. There were beach fishermen, no swimming and you would be mad to even try. The beach shelves sharply and the currents seemed really strong. I found it mesmerizing to sit on the pebbles and watch the waves crash onto the beach. 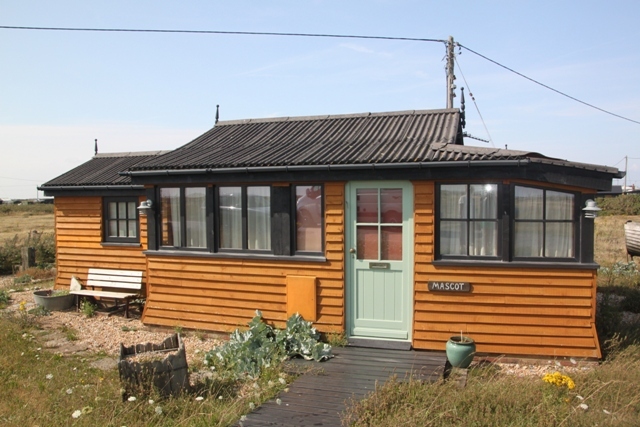 Prospect Cottage, one of those quirky little houses and a little further away from the beach was home to Derek Jarman, a film director also remembered for his shingle cottage garden. He created it in the shadow of the nuclear power station from flotsam washed up nearby combined with salt-loving beach plants. We strolled back to the quaint old fashioned station in plenty of time for our train, taking in more of that shingle landscape. I didn’t expect to love this place so much. 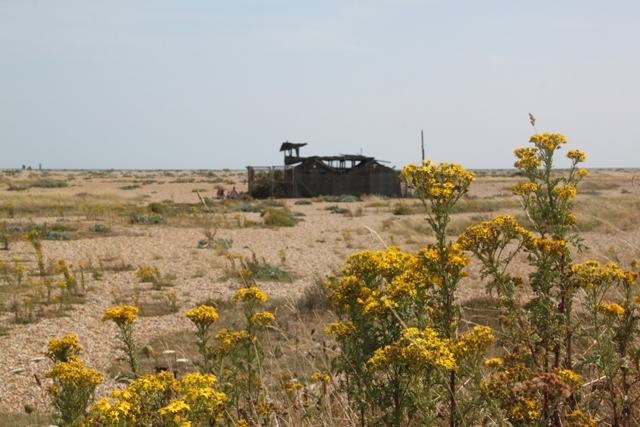 Dungeness is bare, bleak and windblown but so hauntingly beautiful. It really was Cherrie – a great find and a wonderful place, like you say not the sort of landscape you expect at the English seaside – we loved it. It is such a different and beautiful place. 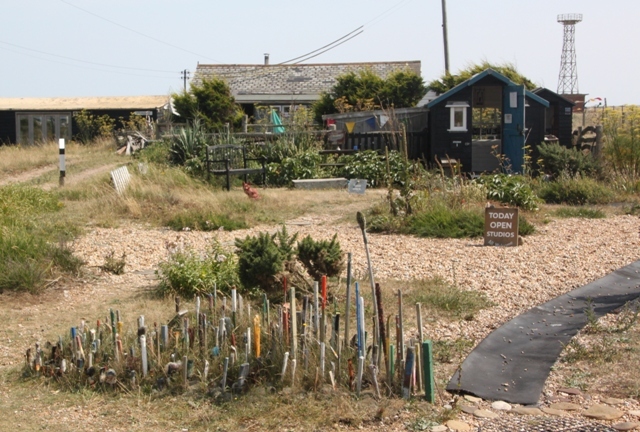 We were blown away by the shingle landscape and quirky atmosphere. Definitely want to go back and you should visit for sure!! i love boardwalks-weird, i know- so your featured shot drew me in. you capture the ‘bare, bleak and windblown’ brilliantly. No not weird at all!! I love them too – something about walking on a boardwalk and following it to the end just captivates me. Such a beautiful place Anne, we had a great day out there. 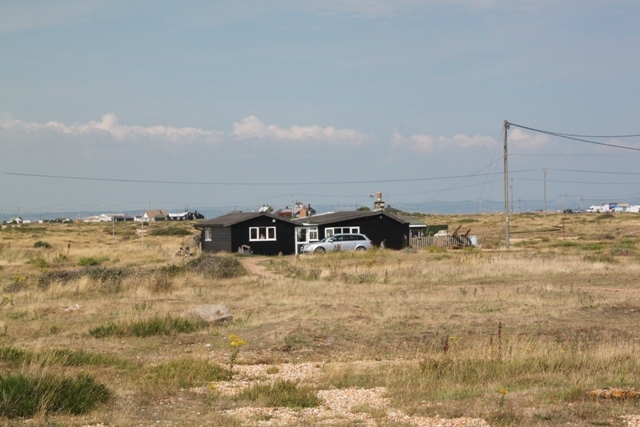 I totally agree, we had heard of Dungeness but didn’t expect it to look like this, totally different from any other place in the UK I have visited. Definitely different and very beautiful for sure. Found this post and pictures fascinating. It appears like a deserted town yet isn’t. What is the picture of the “multiple articles all hung on each other”? It looks like a depository of items thrown away but I could be wrong. Would be intriguing and interesting to visit. Stunning isn’t it!! We weren’t expecting anything quite like this. I don’t know what that weird tree like thing is supposed to be – it was just in the area in front of one of the little houses. Some sort of artwork made from discarded stuff I guess. It is such a great place to visit, we would definitely go back. Such a strange and unexpected place! Would not have thought England to have one like this. Love the quirky art…and the desolation. I am kinda drawn to places like this. It’s a pretty special spot for sure. Something about the bleak landscape, the sea and all that quirky stuff makes it very intriguing. Definitely not what you expect at the English seaside!! Wow, I can’t believe people live in what appears to be such desolation and eeriness. It’s almost like a small village that’s been abandoned. I wonder what’s its like in the winters. Do people live there year round or is it just fisherman during a season? Fascinating place. I think it must be very bleak and cold in winter George – definitely better visited in the summer on a warm day!! People do live here year round though, hardy sorts I suppose. It was fascinating for sure, I would love to go back. How amazing! I immediately had to google to see it on a map. In Kent, of all places! Thanks for taking me to this incredible place. Definitely not what pops into your mind when you mention Kent is it? It is special, bleak and so beautiful – a very different seaside experience. That’s an amazing length of boardwalk! It’s hard to believe this is England but it is certainly beautiful in an austere way! We felt like we had got on board a train in Kent then one hour later arrived in a different country with that amazing and surreal shingle landscape. Very different and very special. It’s such a special place Dennis, not like anywhere else in England for sure. 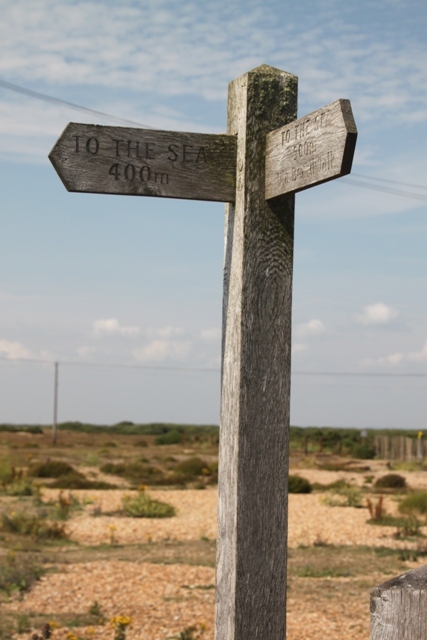 You should definitely try and come here, we just loved the quirky atmosphere and beautiful shingle landscape. It is stunning Suzanne, we didn’t know much about it either and arrived just because we took the small tourist train, but what a wonderful surprise. A special and unique place. I used to visit before the power station, but had never heard it called a desert. Quite different from the nearby Romney marshes, though. The boardwalk and the art work weren’t there back then either. 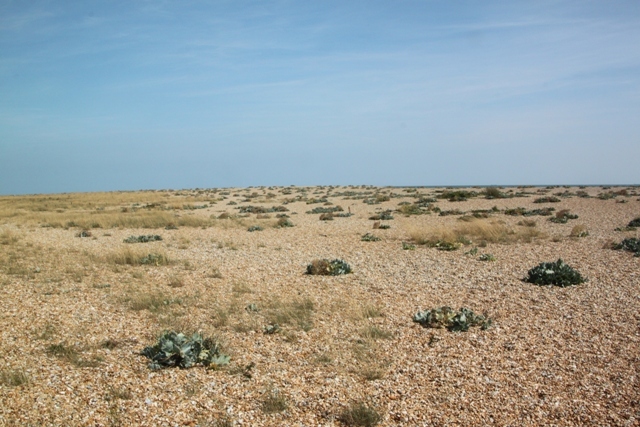 I didn’t know England had a desert until I read the information Dungeness! We saw a bit of the Romney Marshes and yes, totally different in every way. The art stuff just adds to the quirkiness and surreal feeling of the whole place. What an intriguing place..like some of the other comments, I love board walks, especially long ones, as well. You’ve really captured the eeriness in a beautiful way. It’s such an unusual landscape for England and the whole area had the feel of a Wild West deserted ghost town. I just loved it. Thank you Ana – definitely one of the more unusual and intriguing English landscapes. Thanks for coming along Pam!! I had heard of Dungeness but didn’t expect it to be this bleak or beautiful. A very different place, sometimes more like a Wild West ghost town than by the sea in England, then there’s that glorious shingle – so unique and quirky, we just loved it. I agree – some bits made me think of the wild west ghost towns! 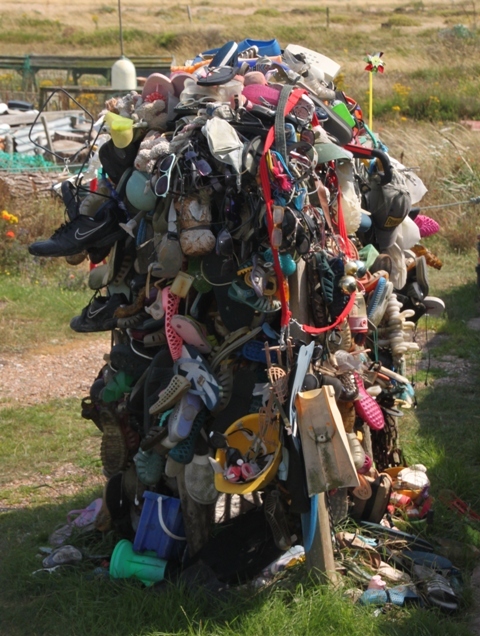 It is very different to what you expect to find at the seaside in England – I loved that!! We really want to Melissa – sounds intriguing and maybe a bit spooky!! Definitely on the cards for some future time. There is something so beautiful about barren landscapes, maybe it’s the simplicity. Love the quirky cottages! Those cottages were pretty cool – especially since they were made from old railway carriages. Nice to look at but not sure I’d want to live in one though! Too fast Jo – slow down time!! This was one of those great surprises Jenny – I’d heard of it but expected a nuclear power station and a beach – not a great picture and definitely not this!! 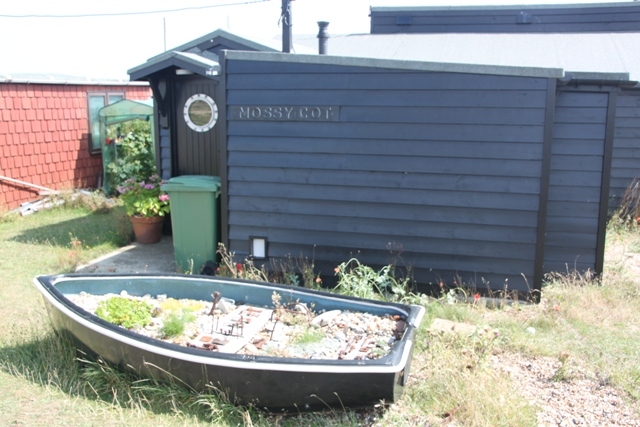 An unexpected treat, I loved the cottages too – so quaint and quirky. Thank you!! 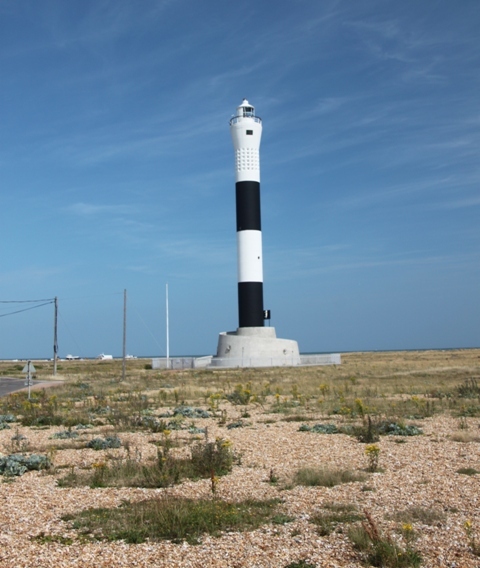 Dungeness is wonderful – definitely worth a visit, we were blown away by the scenery and landscape. Never been to that area Rosemary but I love shingle beaches so sounds like it would be good for us. 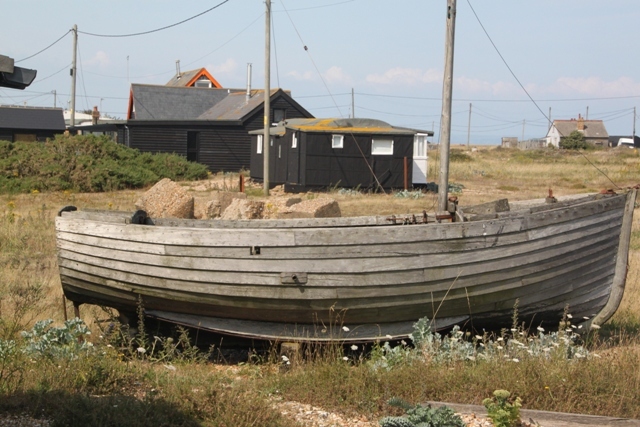 We had a perfect clear, bright and sunny day in Dungeness, it would be a very different place in winter for sure – the little cottage would be very windswept I think. Yes the wind must howl round the little cottage in the winter! The Suffolk coast around Thorpeness is wild and yet pretty at the same time from what I can remember. Just down the road was Aldeburgh, which is famous for its music festival. I remember the fishermen’s cottages being so pretty there and there is a famous “House In The Clouds” at Thorpeness which I think was used as a water tower. I used to love seeing that as a small child! It’s incredible – not what we were expecting at all. If you read about somewhere with a shingle beach and a nuclear power plant, this is not what pops into your mind. Such a wonderful landscape, this was probably one of my favourite days out in a very long time. Deserts have their own beauty. I didn’t know England had a desert. I enjoyed the artwork done here too. It’s great to explore a place that is really ‘different’.